U.S. Customs and Border Protection is launching a $1 million international media campaign aimed at highlighting the risks and undercutting the perceived rewards of illegal immigration. Standing beside the Rio Grande on Wednesday, CBP Commissioner Gil Kerlikowske said the message aimed primarily at Honduras, Guatemala and El Salvador was two-part: The trip to the United States is extremely dangerous, and if an immigrant does arrive they will not be allowed to stay. "We have to stem the flow," Kerlikowske said. He said that 226 immigrants have died crossing the border since October. 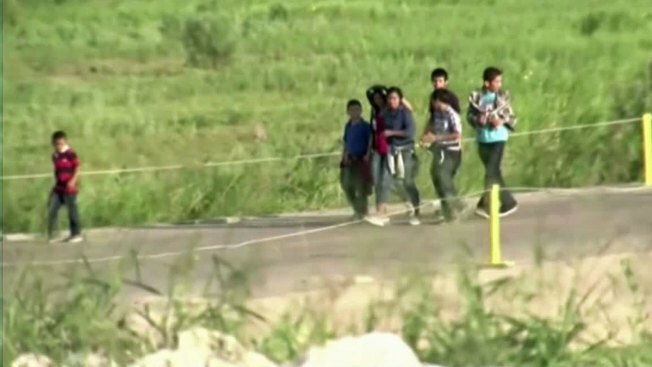 More than 52,000 unaccompanied children have been detained during the same period after entering the U.S. illegally, mostly in South Texas. Three quarters of them came from those three Central American countries where gang violence is pervasive and poverty intense. The so-called "Dangers Awareness Campaign" will employ hundreds of billboards and some 6,500 public service announcements for radio and television stations in Honduras, Guatemala and El Salvador. One offering has an image of a child's footprints in the desert running toward the horizon with the message in Spanish: "I thought it would be easy for my son to get papers in the USA. ... I was wrong." A television spot slated to air in Guatemala shows a teenage boy preparing to leave home for the U.S. His mother pleads with him not to go. He confides to his uncle -- already in the U.S. -- in a letter that she's warning him about the dangers of the gangs on the train that immigrants ride through Mexico, the cartels that kidnap and the dayslong walk in the desert. Ultimately, he writes his uncle, "he who doesn't take a chance, doesn't win." The next image is the boy dead on the cracked desert floor. A voiceover says smugglers' claims that new arrivals will easily get papers are false. The television and radio spots all finish with a similar parting message: "They are our future. Protect them." "We want a relative that is about to send $5,000, $6,000 to a relative in El Salvador to see this message and say, `Oh my god, they're saying that the journey is more dangerous, because of the train, because of the desert, because of the smugglers,"' said CBP spokesman Jaime Ruiz. "We try to counter the version of the smuggler." Ruiz said the campaign is scheduled to run 11 weeks. He will be traveling to cities with large immigrant communities in the U.S. as well to reach the parents or relatives on this side of the border who may help fund a child's trip.